You will need Node 8+ and create-react-app installed on your machine. 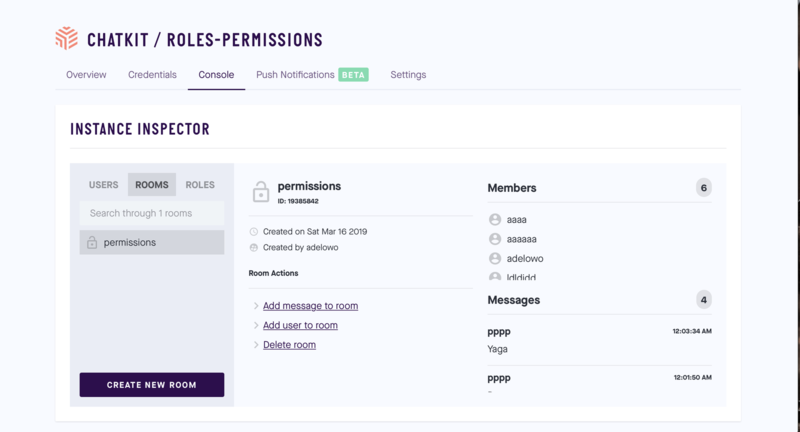 In this tutorial, I am going to introduce how we can allow granular user access control in a chat room with roles and permissions. For example, in a WhatsApp group, only the admin can delete the group while a regular user/member can’t. Building a chat application has been ridiculously simplified by Pusher Chatkit, communities such as a WhatsApp group can be built within minutes. By default, every Chatkit instance comes with two sets of roles - default and admin. Each role comes with its own list of permissions, which specify the actions a user can take. For example, the admin role comes with room:delete permission while the default doesn’t. What this means in practice is only a user with an admin role can delete a Chatkit room. In this tutorial, I will describe how to build a chatroom where a member can add and/or delete other users to the room. I will also introduce roles and take advantage of that to enrich the UI. In the demo below, you will notice the first user has access to the Add User and Remove User buttons, that is because (s)he has admin access while the next user has a much more fine-grained role that doesn’t permit access to those functionalities. A Pusher Chatkit account and instance. Once the dependencies have been installed, create a new variables.env file in the server root and add in the credentials retrieved from your Chatkit instance dashboard. That’s literally all we need to do on the server side for now. You can start the server on port 5200 by running node index.js in the terminal. As mentioned earlier, you will require create-react-app as the frontend app will be built with ReactJS. The above command will create a directory called client that will contain the frontend code. Once it succeeds, you should cd into the client directory so as to install the additional dependencies we will need. Once the dependencies have been installed, you will need to run npm run start to start the application. You can now visit localhost:3000. Since we need to allow for authentication and identification of each user, the next thing to do is to build a login page, this page will be the default and only after authentication will the user be allowed to join the chatroom. As you can see on Line 32, we check for the value of this.state.username. If it is empty, we render the Login component so the user can authenticate against the backend server else we render the Chat component. Please replace PUSHER_CHATKIT_INSTANCE_LOCATOR and PUSHER_ROOM_ID with their original values. In the case of PUSHER_ROOM_ID, you will need to create a room via the console in the Chatkit dashboard and copy the ID of the room. placeholder="Type your message and hit ENTER"
A final step before you visit the application is to create some users and a role in the Chatkit dashboard. You will create a role called admin. As it’s name depict, this role will be given to only select users as it comes with a lots of permissions (thus powers). 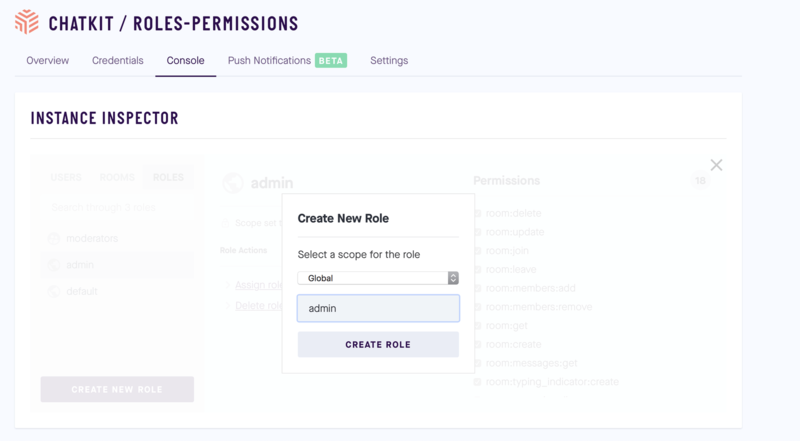 Once you click the CREATE ROLE button, you will be able to select a list of permissions that will be attached to the role. As it is named admin, you should select all available permissions. As at the time of writing, there are 18 available permissions. The next step is to select the role named default. Note that you don’t have to create it as it is created automatically on the creation of a Chatkit instance, it is also assigned to all users. You will need to toggle off some permissions mainly room:members:add and room:members:remove. You will also need to update App.css as the file is quite large, I am going to link to it instead. You should copy and paste the content into App.css. The file can be found here. As seen above, a regular user cannot add and/or remove a member in the chatroom. That is because the role assigned to the user doesn’t have room:members:add and room:members:remove. Although this works, one more thing you need to do is to make sure only a user with the admin role can see the buttons to perform the action. This is purely from a user experience point of view. 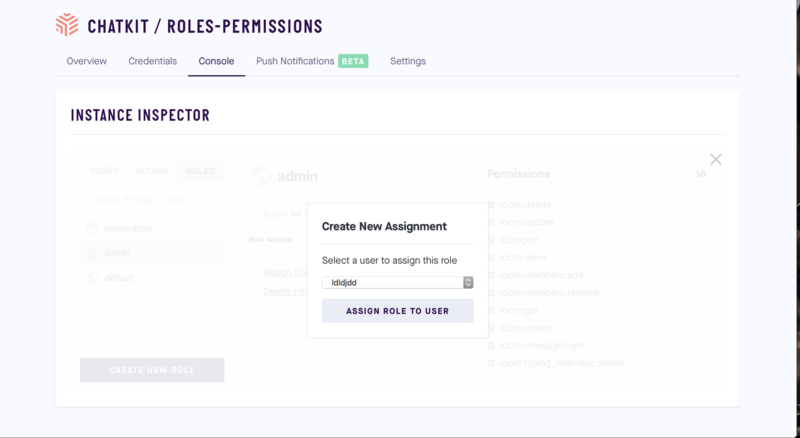 To do this, you will need to fetch the list of roles assigned to the user and check if the admin role is included, that information is then passed to the frontend which then hides or shows the buttons as needed. Remember to stop and restart the server with node index.js. Visit http://localhost:3000 again and login with a user that doesn’t have the admin role. You will notice that the buttons are no longer visible since the user is not an admin. 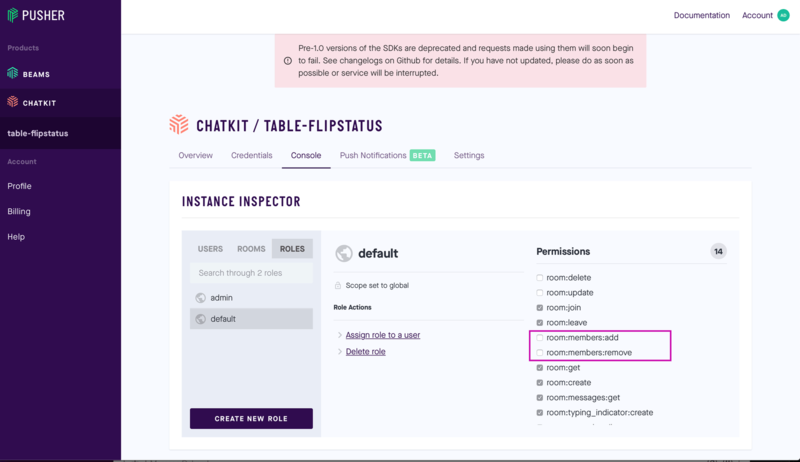 In this tutorial, I have introduced roles and permissions in Chatkit in order to assign fine-grained permissions to users. I have also described how to build a chatroom that describes how to make use of roles and permission to limit users’ action.